After that interview, Dr. Hoffman and I became friends, and I asked him to write a testimonial for my book, which he graciously did. When HONEST MEDICINE was published, I knew that I wanted to be interviewed by Dr. Hoffman for his WOR-AM radio show in New York. I knew he’d do a great job, and that his large listenership would provide me with a unique opportunity to spread the word about the amazing treatments I feature in my book. The interview aired on February 8th, 2011. I urge you to listen to it. Before the show was even over in New York, I began getting emails from Dr. Hoffman's listeners, telling me how much they were enjoying the interview, and asking for information about the treatments featured in mybook. I was happy to oblige. 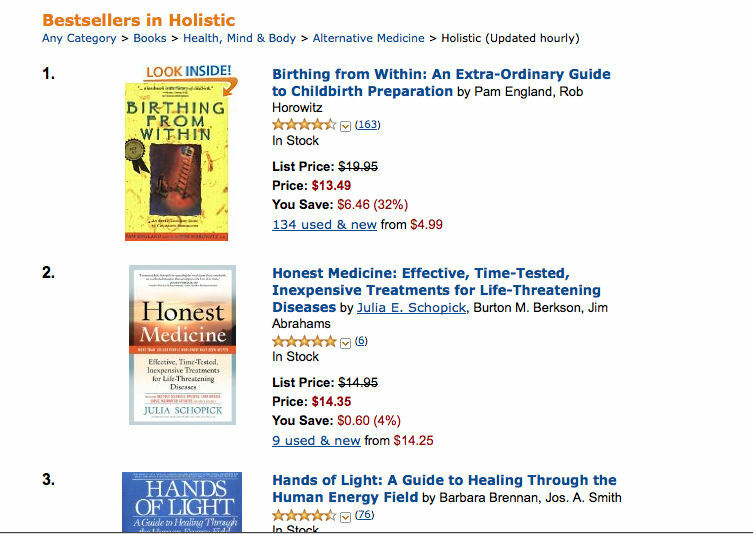 HONEST MEDICINE was an AMAZON.COM BEST SELLER! Here is an Amazon.com screen shot two days after Dr. Hoffman’s interview. 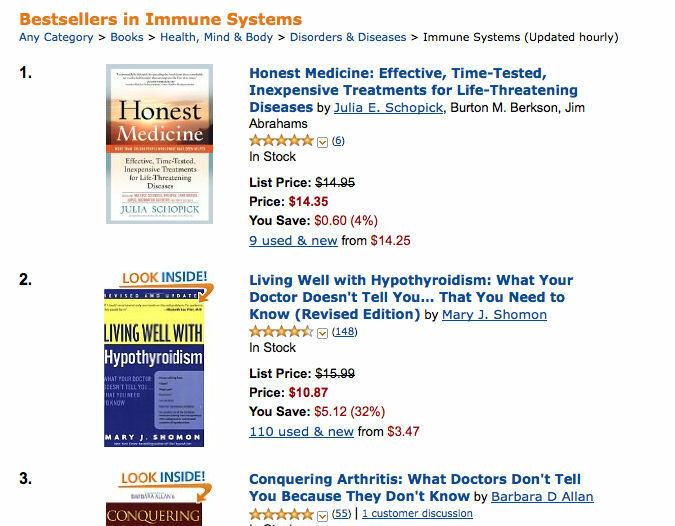 As you can see, HONEST MEDICINE was in the top 4137 books, and #1 in Immune System books, and #2 in the Holistic category!! I can’t thank Dr. Hoffman enough for giving me this opportunity to get the word out about HONEST MEDICINE, so that thousands of people will be able to learn about it. As most of you who are reading this know, this book is a mission and a passion for me. NOTE: If you know of a radio host who is really good--like Dr. Hoffman--and who (like Dr. Hoffman) is knowledgeable about health topics, please write to me. I'd love to be a guest on many more shows like Dr. Hoffman's!! I just wanted to generate a quick comment in an effort to express gratitude for your requirements for the people wonderful pointers you might be posting at this site. Customized poster publishing makes important the particular unique combination regarding great quality publishing and also broadband manufacturing workflow. Typically, this particular program carries from it the advantage regarding extreme creative imagination and of course more focused. Ik voel me blij dat zo'n goede bericht te lezen, wil ik bedanken de auteur voor deze prachtige efforts.this bericht is goed wat betreft van zowel de kennis en informatie. Bedankt voor de post. Thanks for the sharing such a great information.Please keep such kind of the information in future also!!!! Comhghairdeas do phost den sórt sin a blog úsáideach. Tá do bhlag ní amháin faisnéiseach ach freisin thar a bheith ealaíonta freisin. Tá de ghnáth thar cúpla daoine aonair nach féidir a scríobh altanna éasca sin go cruthaitheach. Coinnigh suas an scríbhneoireacht go maith!! Hey there! Tá mé ag obair surfing thart ar do bhlag as mo iphone nua! Just a iarraidh a rá go breá liom léamh trí do bhlag agus táim ag tnúth le do gach post! Coinnigh suas leis an obair den scoth! Jag ville bara skapa en snabb kommentar i ett försök att uttrycka tacksamhet för dina krav på de personer underbara tips du kan utstationering på denna webbplats. L'uomo mi piace il tuo articolo e che era così buono e sto andando a salvarlo. Una cosa da dire l'analisi Indepth che hai fatto è molto remarkable.No si va quel qualcosa in più in questi giorni? Well Done. Solo un suggerimento più si canget un'applicazione Translator per il pubblico globale. You really encouraged me to buy one of Dr Hoffman's books with your articles on this website. It looks like his style of writing is excellent. Regarding Honest Medicine, I would also like to grab a copy as I can imagine the treatments recommended are truly amazing, as you termed them. By strengthening one's immune system, a person can prevent diseases rather than attempt to cure them afterwards. Keepup the great work on your writing and increased exposure.